Alvechurch Community Choir enjoyed a weekend full of music last month. The choir was formed in early 2009 as part of the Everybody Let’s Sing project. This proved to be a very apt title for the activities of the weekend of November 12-14. The choir was privileged to be joined for the whole weekend by Lillian Boutté, the New Orleans jazz and gospel singer, and her band. She stopped off from her international singing tour to revisit the project. She works with schools in Worcestershire, especially special schools, to encourage all children to have the confidence to join in singing. Last year she also launched the Alvechurch Community Choir – on the same principle but for adults. Now the choir has more than 80 members and has sung around the area in venues as varied as cathedrals, retirement homes, village pubs and local festivals. On the Friday night the choir and Lillian sang in Pitcheroak School, Redditch. This was the original “Everybody Let’s Sing” school, and the choir is led by Mike Genders, who teaches music there. The choir was joined by the Withybed Poets from Alvechurch, who read a short selection of their work. The school hall was packed and the fund-raising concert made over £750 for the project. On Saturday, the whole day was given over to a singing workshop. Members of the choir said how pleased they were to have time to really get to grips with some of their songs, and rehearsing with Lillian and the band was a delight. 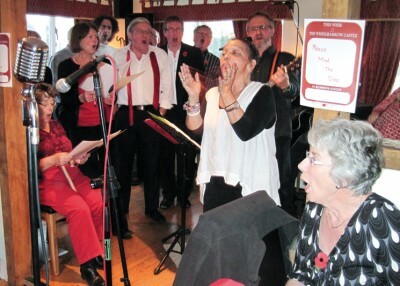 On the Sunday the choir moved to the Wheelbarrow and Castle pub at Radford, near Inkberrow. After eating lunch, they sang to the customers, and a recording was made to form a CD of their music. The Withybed Poets read another selection of poems, and Lillian and the band provided a rousing set of songs. For both of the concerts, the audience joined in the singing too, and everybody really did sing. Even after the end of the performance proper, the choir and band didn’t want to stop and carried on singing until their coach arrived. Lillian said that the choir had become more than just a choir: she felt as if they were a family. * The Community Choir meets every Monday in term-time, three weeks at Alvechurch Middle School and the fourth week at the Crown Inn at Withybed Green. The members are drawn from a wide range of ages and backgrounds, and singing abilities, and everybody is welcome.